When you plan your Savannah vacations, it's a must to stay in the historic downtown so you can have the chance to walk to many of your destinations. By staying in downtown Savannah vacation rentals, you also get to experience some of the nostalgic charm firsthand. 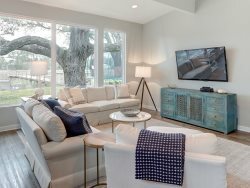 Southern Belle offers some of the best vacation rentals in Georgia with a wide range of choices, from renovated old architecture to brand new and modern. Whatever your taste may be, chances are we have it. The best thing about our Savannah vacation rentals, besides the fact that they're stocked with all the amenities of home, is that they are right in the heart of downtown. Our Price Place property, for example, is located on East Hall Lane, not far from Forsyth Park and Mother Matilda Beasley Park. It's also close to restaurants, shopping and historic squares. This property can sleep six guests in three bedrooms with two and a half bathrooms. If you prefer modern vacation rentals in Georgia, this one is likely to be right up your alley. It's newly remodeled with classy, modern decor, wood floors and ceiling fans throughout. The kitchen is outfitted with stainless steel appliances and glossy granite counter-tops. It includes both a separate dining area as well as an island bar with seating for two. The house is light and bright with a mostly white color theme and plenty of large windows. You'll find comfortable bedrooms with pleasant decor, flat screen TVs and other amenities like night stands and seating areas. If you choose this property on your Savannah vacations, you will get one king en suite bedroom, two queen bedrooms, one private parking spot, proximity to grocery stores, an outdoor patio in the back, cable and Wi-Fi as well as a washer and dryer in the house. Southern Belle also provides a complete array of amenities to make you feel totally at home. The kitchen is fully equipped with appliances, dishes and utensils, allowing you to cook at home during your stay. Towels and linens, as well as necessities like trash bags and paper towels are also provided. If you need to stay connected, you'll have no problem doing that with our in-house Wi-Fi. Flat screen TVs are located throughout and provide cable to keep up with your favorite shows. The neighborhood this property is located in is about equal distance from the famous Forsyth Park and Mother Matilda Beasley Park, which honors the first nun of African-American descent in Georgia. Forsyth Park is, of course, one of the famous settings of the book and film "Midnight in the Garden of Good and Evil." It is known for its iron fountain that was built with the Paris grand fountain as a model. Another nearby historical attraction is the Cathedral of St. John the Baptist. The church was constructed between 1873 and 1876 and is a beautiful display of French Gothic architecture. You won't want to leave Savannah without taking a visit to River Street. Nine blocks of brick walkway is a great place to simply walk or watch ships come in. It's also packed with restaurants, boutiques and galleries. Check with our helpful customer service to find out the details. Another regular event happens on the first Saturday of every month down on River Street. Start your Savannah vacations the right way by booking one of Southern Belle's amazing Savannah vacation rentals for your stay. Don't waste your time looking up all the other vacation rentals in Georgia when you can get Southern Belle's unbeatable combination of location, amenities and all the comforts of home. All correspondence was handled on-line and clearly communicated. Timely updates and reminders were appreciated. My entire, first time rental experience was amazing and I will do it again. Our rental unit was enjoyed by all of us. The clean, new, style and furnishings were nicely matched. The location was perfect. We were happy to find a Kroger grocery store and quaint coffee/ Mate' shop within walking distance. The free Local DOT bus pick-up was close by as well, which we utilized. Parking for a second car was no problem on the side street. We did have road noise, but made do. The back porch/patio was a gem for the few days of 79* weather. Absolutely a Great Pick! It was very updated and beautifully decorated. We enjoyed our stay. The property is much more beautiful in person and had everything you would need during your stay. The location was also perfect. We would defiantly stay here again. , great location, quality furnishings and modern decor and it felt a very loved home. Excellent accommodations! The house is clean, stylish and comfortable. Your team members were great, both on the phone and by email. As I said above, we loved it!! We have stayed in vacation rentals in Hawaii, Florida, and Maine before, and this was one of the best properties at which we have stayed!! Everything about the home was new and beautiful. Thank you for a wonderful experience!!! !